I work from your photographs, which can be emailed to me, if they are in a digital format, or sent by "snail mail" if you don't have a digital image and don't want to scan existing photos. Printed photos will be returned to you. I will make every effort to treat all photos with the same care and respect that I would my own, however, I cannot be responsible for any damage or loss. If your printed photo is rare or irreplaceable, please have the image duplicated and send the duplicate. It is important to have a photo of a pose or expression that you like, as this will be the basis of the painting. Additional photos are helpful if they provide details missing from "the pose" photo. Please note that clarity is much more important for my purposes than size; a small, clear photo is much better than a large, fuzzy photo. Some people know exactly which photo they want; sometimes it's not so obvious. You can send me several photos and we can discuss which ones would work the best for a portrait. I'm happy to provide input. If you are local (central Ohio), please consider setting up an appointment so that we can go over your photographs together and decide which one would make a great portrait. This will also give you an opportunity to view some original artwork in person and to see what the different sizes really look like. 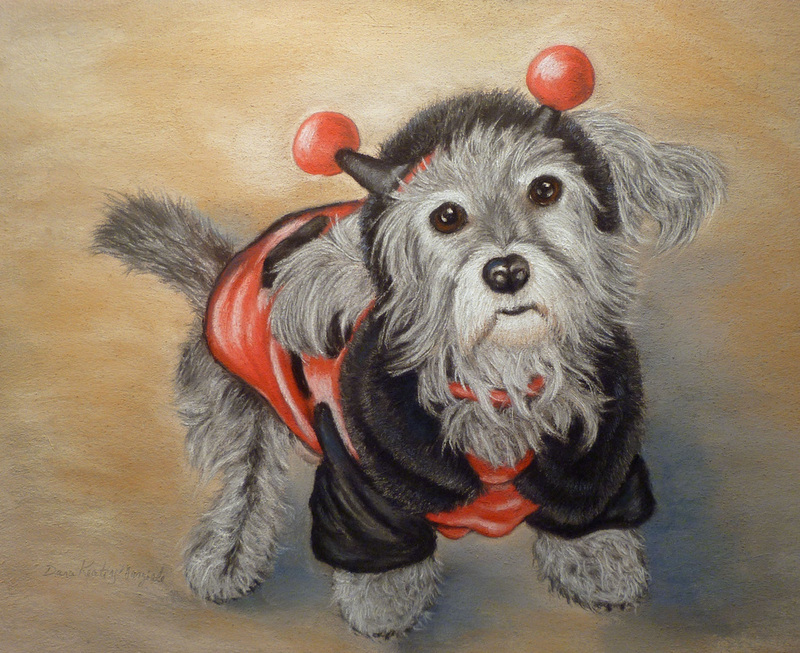 The time it takes to complete a portrait varies, but a portrait of a single pet typically takes four to six weeks. Please plan ahead for holiday gifts. Let me say that again....Please plan ahead for holiday gifts, especially if shipping is required. September is not too early to initiate the process of having a portrait painted as a gift for Christmas, as there are probably several other people who have thought the same thing, and I hate to turn people away simply because they waited too long to contact me. Here is a photo of my own dog, Sophie. (The outfit was her idea, not mine...) The photo is clear enough and detailed enough that it could serve as the basis for a portrait on its own. But...it is nice to have a close-up of some details, especially the face, if such a photo is available. Sophie's portrait, based on the photos above.